Since 4 years we are participating in the Carolo-Cup of the TU Braunschweig which takes place yearly. 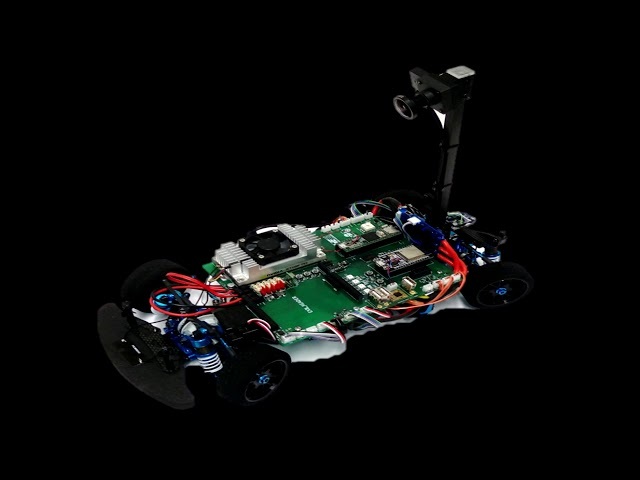 The Carolo-Cup is a competition in which universities from germany and some other international countries are challenging each other by which team can build the best autonomous driving rc car in scale 1:10. There are rules for the competition about the enviroment, road markings, additional objects etc. We used a Jetson TK1 in our previous two cars and switched to a TX2 now. The base frame is a standard rc car chassis. We modified it by making the rear axis steerable, added a camera, a self designed board and two microcontrollers to control the motor and the two servos. We are developing in C++. Mostly our software project uses classic image processing but in the last year we added a neural network (All Convolutional Net) to differentiate markings on the road. This year we added a second neural network (YOLO: Real-Time Object Detection) to detect traffic signs. We are using these two networks to merge the information to know what the car has to do next. The classic image processing is running on the cpu cores of the TX2 and the two networks are running on the GPU. The Software is running at 45 fps and YOLO is running at 20 fps.